Crews patch them, just to see these recurrent potholes come back again. New research focuses on microwaves zapping patches to make a more permanent pothole fix. Some potholes are like zombies – they never die. Or at least that’s the perception of much of the driving public, especially as we enter peak pothole season: late winter and early spring. At a minimum, potholes create rough roads and poor driving conditions. Too often they degenerate into vehicle-damaging safety hazards that incur the wrath of drivers, attract negative attention from the news media and adversely affect commerce by disrupting or slowing traffic. Our nation’s deteriorating roads – of which potholes are an obvious manifestation – are a drag on our economy. That’s why transportation department maintenance crews and pavement engineers continue to stress the need for more effective and efficient pavement repair and maintenance. From their perspective, the ideal repair would last at least a year, could be performed in all seasons, and could be installed easily and relatively quickly – all while keeping traffic delays to a minimum and repair costs down. Recurring “zombie” potholes are too often a reflection of the type of method that’s used to patch or “fix” them – many of which are short-lived and only marginally effective. Researchers around the world, including my colleagues and me, are working to develop better and longer lasting repair alternatives. At the same time, researchers and pavement engineers in academia and in the private and public sectors are developing improved construction techniques and innovative pavement formulations – such as “self healing” materials – that will help prevent potholes from forming in the first place. But we still have to deal with the millions of miles of roads – and their potholes – we already have. Animation describing the birth of a pothole. 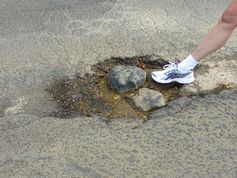 Potholes are symptomatic of underlying structural and/or pavement problems. They form when water penetrates a crack. In cold climates, that water freezes and expands, pushing up on the overlying pavement. Repeated freezing and thawing is a great way to create a pothole. Water also softens and weakens the base material below a pavement, making it susceptible to deformation by passing traffic loads. As the base material deforms, the pavement loses structural support and breaks up. And another pothole is born! Bottom line: a roadway marred by multiple potholes means the pavement is probably failing and should be replaced. But before that can happen, potholes still need to be repaired. Traditional repair techniques are, at best, temporary fixes. Take “throw-and-go” cold patching methods, for example. These use repair mixtures that are worked when cold. Some cold patch repairs don’t bond well to the edges of the hole, a shortcoming made worse when attempting a repair under challenging wintertime conditions. The same pothole repaired with cold mix patches may have to be redone several times a winter. Without a good interface bond, the freezing and thawing cycles of late winter and early spring can further weaken the repair and enlarge the crack between the patch and the surrounding pavement. Another way a repair gets weakened is analogous to hydraulic fracturing, or “fracking.” The tires of vehicles passing over the repair forcefully push liquid water and fine aggregate particles down into the crack, progressively widening any cracks. Road salt further enhances the latter effect by keeping water in liquid form in subfreezing conditions. Together, it’s all a prescription for a repair’s early demise – hello again, zombie pothole. In an effort to address the ongoing need for better repair mechanisms, my colleagues at the Natural Resources Research Institute - University of Minnesota Duluth, outside project collaborators, and I recently completed a study to evaluate promising innovative pothole repair tactics. Our emphasis is on all-season approaches that use the iron oxide mineral magnetite (Fe3O4). 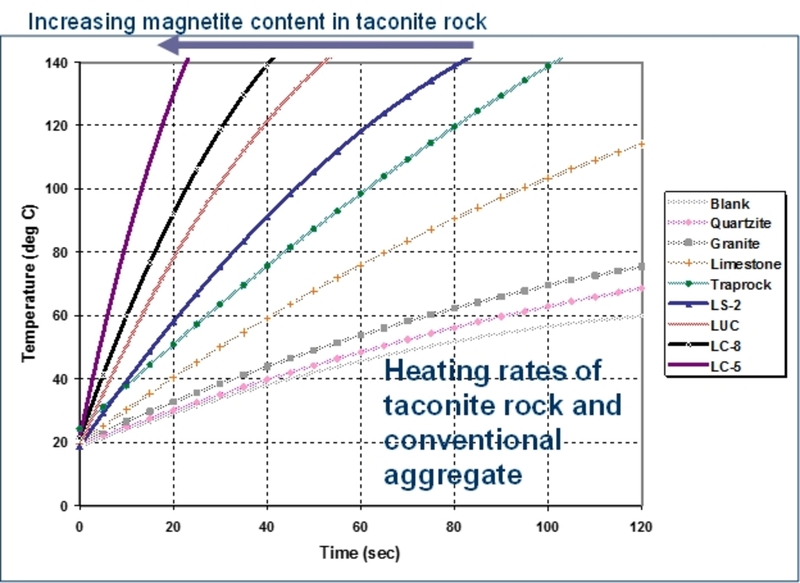 More than 10 years ago, we showed that magnetite and magnetite-containing rock were excellent microwave energy absorbers. The mineral is contained in iron ore rock mined and processed on Minnesota’s Mesabi Iron Range, and has the ability to readily absorb microwaves and heat very quickly. We started thinking: when combined with portable microwave technology, could magnetite-containing materials be an effective solution to cold-weather pothole repair? We mixed small amounts (1 to 2 percent) of magnetite into patching compound, typically made of recycled asphalt pavement (RAP) augmented with ground-up recycled asphalt shingles (RAS); the RAS adds a little more asphaltic binder to the overall mix. Then we pack the mixture into a pothole and microwave until the binder softens and is compactible, thanks to the magnetite. Here’s our cookbook recipe (emphasis on cook) for the microwave repairs we performed. First, find a pothole (easy). Clean loose debris and/or blow water from pothole. In subfreezing temperatures, preheat pothole and pavement adjacent to hole with microwave unit to melt or debond any ice or snow in the hole, and to soften the surrounding pavement. This warming contributes to a good bond since the edges of the pothole are able to plasticly intermix – that is, smush together – and meld with the patch material. Remove or blow out loosened/melted ice/snow. Place mixture of RAP, microwave-absorbing taconite materials, and RAS into the pothole. Overfill the hole by about two inches to allow for final compaction. Heat mixture until temperature reaches at least 100°C (212°F) at base of mixture in the hole. Sufficient heating takes place in about 8 to 12 minutes at a 40kW power level. Tamp down heated mixture with portable gasoline-powered compactor. The existing pavement essentially becomes part of the repair itself – a unique and key benefit of this technique. And our repairs showed excellent longevity, with some performing well more than two years after their installation. Obviously, we’re not just opening the door of a kitchen microwave oven and pointing it down at the road. In the pilot test, we worked with a small company which had previously developed a truck-mounted microwave system to thaw frozen ground to access buried utilities. They adapted their high-power (50kW), vehicle-based microwave system for the project. And it wouldn’t be much of a stretch for Minnesota’s taconite industry to supply the relatively small quantities of magnetite a repair compound would consume. The industry typically produces about 40 million tons of magnetite concentrate annually, and generates tens of millions of tons of additional byproduct rock that also contains magnetite. The byproduct taconite rock actually represents a potential source of hard and durable high quality aggregate for our nation’s roads and highways. One welcome side effect of the in-place heating mechanism is that it drives off moisture, letting the patch more readily adhere to the surrounding pavement. Patch material can be premixed and stockpiled or mixed on site. And you don’t need to keep material hot during transport, making this patching system well-suited for cold weather situations. 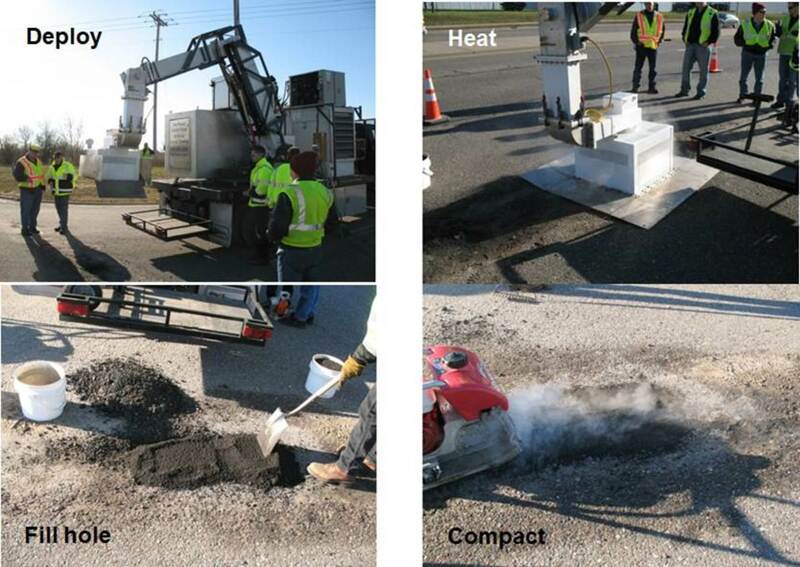 Importantly, our project also demonstrated that an effective microwave pothole repair compound can be made almost entirely from inexpensive and abundant recycled materials (such as RAP and RAS) that many maintenance departments have on hand, as opposed to repair compounds that rely on specialized asphalt formulations, virgin asphalt and/or specialty binders. Microwave technology is not yet a routine method of repair, and it’s best-suited for potholes in asphalt rather than concrete. But this approach merits further consideration, and we are working to advance the technology. After all, given our nation’s aging network of roads, zombie potholes will continue to flourish. Microwave repair could be an effective method for keeping them at bay. Larry Zanko, Senior Research Fellow in Economic Geology at the Natural Resources Research Institute, University of Minnesota Duluth. This article was originally published on The Conversation. Read the original article.